A beautiful and historical Four star hotel, situated only 800 m from the beach of the Vistula Bay, offers its guests unforgettable stay in the beautiful area surrounded by woods. Close to the hotel there is the former summer palace of Emperor Wilhelm II of Germany. Nearby guests can visit such historic monuments of Poland like the Malbork Castle and Frombork Cathedral as well as the Old Town of Gdansk. The Kadyny Country Club features 43 rooms equipped with a private bathroom with dressing gown, mini bar, satellite TV, wireless Internet access (Wlan), radio-alarm, hairdryer, and direct dial telephone. The hotel has a restaurant, bar, indoor and outdoor pools, sauna, beauty salon, mini golf, horse riding. In the hotel guests can choose between 2 restaurants. You can savor delicious Polish cuisine in the Old Distillery restaurant with a splendid 10 meter tall fireplace. In the cozy Fireplace Restaurant, that is open until the last guests, you will enjoy meals listening to jazz music. In summer you may also dine in the beautiful rose gardens. Guests will relax their body and soul in the modern Wellness Centre with a swimming pool, Finnish and Turkish saunas, Jacuzzi, as well as massages and beauty treatments. For further entertainment we have a newly opened 18 hole mini golf course and a volleyball court outside. If you wish to explore the beautiful countryside made up of hills near the coastline you may take a mountain bike or horse ride. The adjoining stables have 100 horses as well as trap rides. The hotel is experienced in organizing conferences and integration activities. These may be on the water using motor and pontoon boats or jet skis or on land with quad bikes, off road vehicles or orienteering exercises with GPS. We have many interesting winter programs as well with snow scooters and wolf driving. In the evenings the hotel organizes a karaoke evening, Al Capone evening, Sea Shanty evening or a Medieval Evening with fighting knights to mention just a few. During the day you may choose to visit some of the nearby wonderful historical attractions. Malbork castle is just forty minutes away and is the largest Teutonic castle in Europe . Frombork Cathedral, 12 km away with its fortifications and wonderful view of the bay marks the site where Copernicus discovered that the Earth revolves around the Sun. Gdansk , site of the first shots of the Second World War, and the beginning of the end of the Eastern block makes a wonderful day trip with her Hanseatic Old Town and many museums and shops. 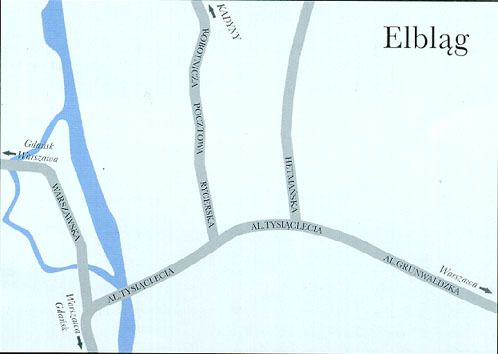 Within a short drive guests will reach the Elblag Ostroda canal, one of landmarks of the region. It is the only overland canal where boats are pulled upwards on land to overcome the different water levels. The hotels is conveniently located between these attractions and those of Masuria , including Hitler’s bunker and the 1000 lakes. All excursions may be organized by the hotel. The hotel is easy to get to now thanks to the many cheap airlines coming to Gdansk International Airport from where we can organize a transfer. We have many family offers all year round as well as special occasions such as Easter and New Year. The hotel is easy to get to now thanks to the many cheap airlines coming to Gdansk International Airport from where we can organize a transfer. If you drive you must head for Elblag and take a left turn on the E7 main road once in Kazmierzowo and take the road for Frombork. Kadyny is well signposted after this. The price of lunch is from PLN 45. We offer you to use our conference room. The Kadyny Country Club is located 15 km away from the city centre, about 15 km away from the main railway and bus station. The airport is 75 km away from the hotel. From Elblag railway station: Tolknicko direction should be followed according to the signs. 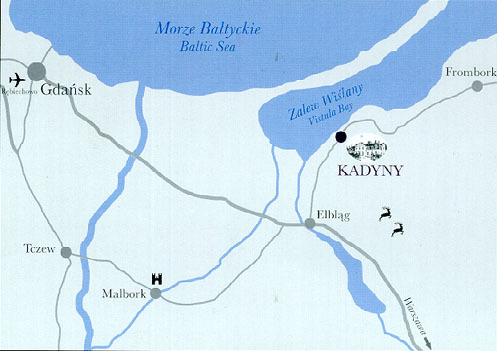 Kadyny are 4 km before Tolknicko.